Since 1993, Lisa Mazzarella has been the "early morning voice" on WVIA-FM. From 6 a.m. to 9 a.m., she is the local host during NPR's "Morning Edition" and produces regional newscasts. From 9 to 11 a.m., she produces and hosts a classical music program highlighting some of the "lighter fare" included in the WVIA-FM music library. With the goal of making classical music accessible to everyone, she recently inaugurated "The Classical Club" which encourages audience feedback, commentary, and musings about selected pieces of music featured during the morning show. 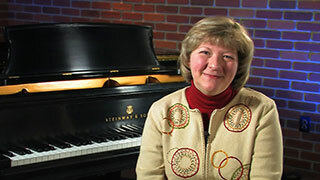 Lisa is also the producer of the very popular WVIA TV "Our Town" documentary series. Aside from her radio work, Lisa has also voiced television documentaries for WVIA-TV, and is the current underwriting voice for the television station. She has written entertainment reviews, arts profiles, children's poetry, and biographical articles for local and national publications. She currently serves on the Advisory Board of the Scranton Civic Ballet Company, moderates area symposiums in the arts and health fields, and is an adjunct communications instructor at Marywood University in Scranton -- where she received her B.A. in Communication Arts.